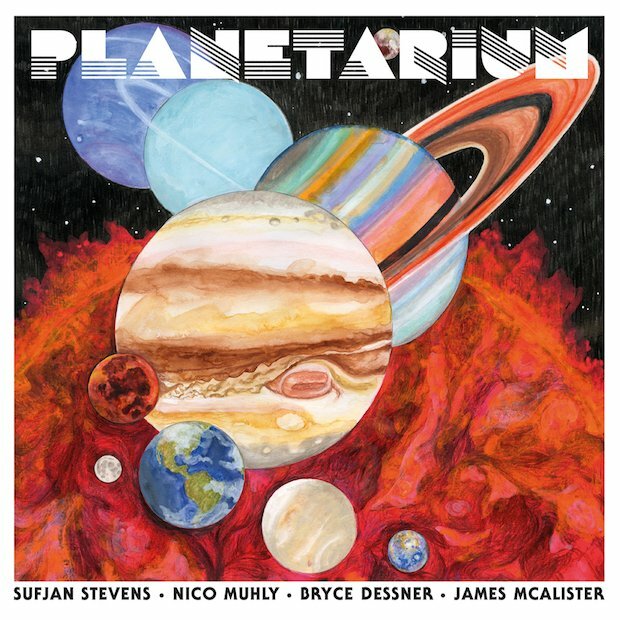 Opening track ‘Neptune’ eases the listener in with some gliding falsettos from singer-songwriter Sufjan Stevens over some delicate pianos. Classical orchestration courtesy of Nico Muhly then joins the palette for a first taste of the grandiosity to come. However, it’s ‘Jupiter’ with its distorted drums courtesy of James McAlister, fluttering guitars courtesy of Bryce Dessner and huge horns from Nico Muhly that launches the album through the stratosphere into a place of no sonic bounds – a place that the album continues to explore for its duration. Planetarium could never be accused of not being ambitious. If anything it’s completely ostentatious and overblown. But there’s a nerdy charm to its intergalactic contents, helped by the fact that it all sounds absolutely gorgeous. Okay, maybe gorgeous isn’t true for all of it. There are parts of the album you’ll spend clawing onto some semblance of melody or beat (as on ‘Mars’). And whilst Sufjan through a Daft Punk-esque vocoder sounds cool, Sufjan on auto-tune feels like a step too far (he reminds me of ‘Owl City’). But, of course, all of this contributes to the album’s theme of space. Honestly, what space-themed LP would be complete without robo-vocals? As for the musical passages that collapse into dissonance, they serve only as a reminder of how overwhelmingly unfathomable the universe is, too unfathomable to be summed up by our human construct of melody (in the case of ‘Mars’, the dissonance also seems to aptly symbolise the chaos of war – Mars being the god of war). Not all of the tracklist appears to be arranged in the most sensible way, which damages the flow of the album. Ambient instrumentals ‘Black Energy’, ‘Sun’ and ‘Tides’ are lumped together instead of separated by songs, which only seems to form a napworthy lull in the middle of the album. Other tracks meanwhile cut out abruptly at the end when they could have neatly segued into the next track. Fortunately, for the most part, each singular track flows well. And all musicians seem to be in good form. The classical instrumentation of Nico Muhly feels cinematic enough to eat popcorn to. Sufjan’s vocals, whilst sparse and chorus-less, are still enunciated in a way that’s catchy enough to hum on repeat listens, whilst his lyrics are as poetic as ever. Bryce Dessner’s effervescent guitar playing meanwhile fits in perfectly, even if I’ve never been a fan of his band The National. Even drummer James McAlister, of whom I’m not familiar with, proves his worth with a diverse mix of raw and electronic percussion. Will this supergroup live to make another album? It’s hard to say where they can go from here, but hopefully they may be able to improve the flow whilst maintaining their creative and emotive musicianship. If this is only a novelty project, then it’s still a memorable project for being as brilliant bombastic as it is.